If however, you want to purchase items from using both coupons, simply place a separate order for the second coupon code and we will combine your shipping and refund the difference to you when we see two orders with one name. You can also contact us via email, FB, etc if you want to include both order numbers to make sure the orders are combined. If we miss one, we will ship it for FREE! As always, all orders over $150 ships FREE within the US. (not the combined order total but each separate order total ). And now for the main announcement, please find below the April release winners. All winners were picked through Random.org. Kathleen has now created a special email address only for winners so your email will not get mixed with the business side of things. 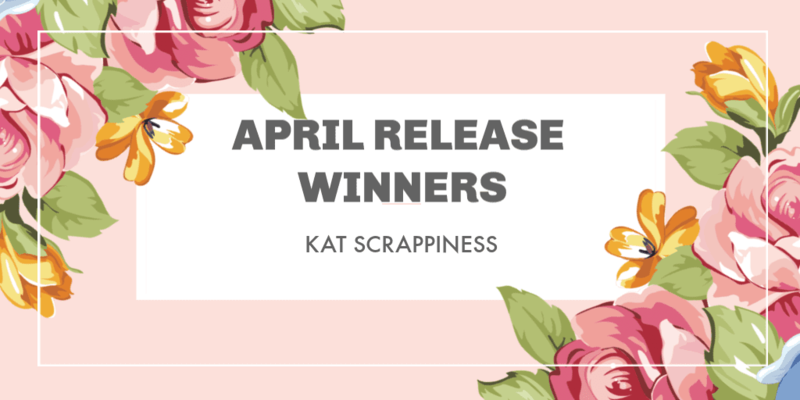 Winners, please send your mailing address to Kathleen at: winners@katscrappiness.com to claim your prize within 48 hours. Day 2 – Sue D.
WE ALSO HAVE A SPECIAL GIFT WINNER! Anyone who placed an order using the supplies link from the April release posts was entered into a drawing. Please look at your order number and send us a message if you are the winner. Special Gift winner wins a Kat Scrappiness Die set of her choice.